THIS WEEK, the College of Cardinals is expected to vote for a new pope. The election is getting serious. In fact, some of the cardinals have been dancing to Psy’s ‘Gangnam Style’ just to win votes. 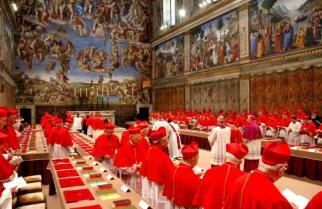 Some 115 cardinal electors gather in Sistine Chapel to elect a new pope. Reports say the cardinals will be praying and voting four times. Yup, four times. That’s worse than some Filipinos who vote twice during elections. According to the rules, if a new pope is not elected in two or three days it means the cardinals are probably severely divided – that, or the votes from Lanao and Maguindanao don’t tally with the actual number of voters. Firefighters have installed the Sistine Chapel chimney that will tell the whole world when a new Pope is elected. A black smoke from the chimney means there’s no winner yet; a white smoke signifies the election of a new pope, and a red smoke means Santa Claus was trapped and got toasted. 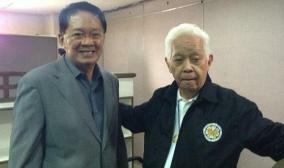 President Aquino’s two new picks for Comelec commissioner, Macabangkit Lanto and Ma. Bernadette Sardillo both declined their appointments. The Comelec is in panic mode now since the conclave will start in less than 24 hours. Macabangkit Lanto and Bernadette Sardillo who both declined their appointments to the Comelec were chosen by President Aquino to replace retired poll officials. The President should replace his search committee first. The latest Pulse Asia survey is out. It’s 8 for Team PNOY, 4 for UNA and 6 for political dynasties. Now ranked sixth, Team PNOY’s Bam Aquino is the biggest gainer. The survey has a margin of error of plus or minus 2 lbs. According to the World Giving Index, the Philippines is the second “most giving” nation in Southeast Asia and 17th among 160 countries in the world. We are really generous. We give to charity, we give to strangers, and we give up our claim to Sabah. Senatorial aspirant Miguel Zubiri of UNA said, “Win or lose, my wife and I are making baby No. 3.” With or without that baby No. 3, we don’t care! Nice one – to start the week with a laugh. Pulse asia survey also gave me convulsions. Be self-proclaimed voice of the youth! – 403 twitter followers! Social entrepreneur! – have never ever seen a hapinoy store! Be professional bighead – 30+ years of bamality to look forward to! Family owns survey firm – aahh, that’s how. In politics, a myth is more powerful than reality, the name more important than the ideology,and a lookalike a reminder of the real thing. I haven’t laughed so hard for a while until this latest post. Thanks. so conclave is the collective term for a gathering of paedophiles. you are lucky libertas that i am not moneyed or else i will sue you for libel on behalf of the cardinals, me ganuon? You could keep a lot of lawyers happy and rich!